Kung Fu is an American action-adventure martial arts western drama television series starring David Carradine. The series follows the adventures of Kwai Chang Caine, a Shaolin monk who travels through the American Old West, armed only with his spiritual training and his skill in martial arts, as he seeks Danny Caine, his half-brother. Many of the aphorisms used in the series are adapted from or derived directly from the Tao Te Ching, a book of ancient Taoist philosophy attributed to the sage Lao-tzu. Kwai Chang Caine (David Carradine) is the orphaned son of an American man, Thomas Henry Caine (Bill Fletcher), and a Chinese woman, Kwai Lin, in mid-19th-century China. After his maternal grandfather's death he is accepted for training at a Shaolin Monastery, where he grows up to become a Shaolin priest and martial arts expert. In the pilot episode Caine's beloved mentor and elder, Master Po, is murdered by the Emperor's nephew; outraged, Caine retaliates by killing the nephew. With a price on his head, Caine flees China to the western United States, where he seeks to find his family roots and, ultimately, his half-brother, Danny Caine. Although it is his intention to avoid notice, Caine's training and sense of social responsibility repeatedly force him out into the open, to fight for justice or protect the underdog. After each such encounter he must move on, both to avoid capture and prevent harm from coming to those he has helped. Searching for his family, he meets a preacher (played by real-life father John Carradine) and his mute sidekick Sonny Jim (played by real-life brother Robert Carradine), then his grandfather (played by Dean Jagger). During four episodes of the third and final season ("Barbary House", "Flight to Orion", "The Brothers Caine", and "Full Circle"), Caine finds his brother Danny (Tim McIntire) and his nephew Zeke (John Blyth Barrymore). David Chow, who was also a guest star in the series, acted as the technical and kung fu advisor, a role later undertaken by Kam Yuen. In her memoirs, Bruce Lee's widow, Linda Lee Cadwell, asserts that Lee created the concept for the series, which was then stolen by Warner Bros. There is circumstantial evidence for this in a December 8, 1971, television interview that Bruce Lee gave on The Pierre Berton Show. In the interview, Lee stated that he had developed a concept for a television series called The Warrior, meant to star himself, about a martial artist in the American Old West (the same concept as Kung Fu, which aired the following year), but that he was having trouble pitching it to Warner Brothers and Paramount. In the interview, Pierre Berton commented, "There's a pretty good chance that you'll get a TV series in the States called 'The Warrior', in it, where you use what, the Martial Arts in Western setting?" Lee responded, "That was the original idea, ...both of them [Warner and Paramount], I think, they want me to be in a modernized type of a thing, and they think that the Western type of thing is out. Whereas I want to do the Western. Because, you see, how else can you justify all of the punching and kicking and violence, except in the period of the West?" Later in the interview, Berton asked Lee about "the problems that you face as a Chinese hero in an American series. Have people come up in the industry and said 'well, we don't know how the audience are going to take a non-American'?" Lee replied, "Well, such question has been raised, in fact, it is being discussed. That is why The Warrior is probably not going to be on." Lee adds, "They think that business-wise it is a risk. I don't blame them. If the situation were reversed, and an American star were to come to Hong Kong, and I was the man with the money, I would have my own concerns as to whether the acceptance would be there." 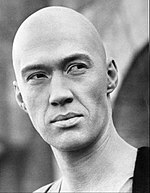 Whether or not Kung Fu was based on a concept by Lee, he was undoubtedly considered for the starring role, according to Herbie Pilato in his 1993 book The Kung Fu Book of Caine: The Complete Guide to TV's First Mystical Eastern Western (pages 32–33), and David Carradine himself in a 1989 interview mentions that Bruce Lee was passed over for the role. The series aired on ABC from October 1972 to April 1975 for a total of 63 episodes. Kung Fu was preceded by a full-length (90 minutes, with commercial breaks) feature television pilot, an ABC Movie of the Week, which was broadcast on February 22, 1972. The series became one of the most popular television programs of the early 1970s, receiving widespread critical acclaim and commercial success upon its release. The Shaolin Monastery which appeared in flashbacks was originally a set used for the 1967 film Camelot. It was inexpensively and effectively converted for the setting in China. The series used slow-motion effects for the action sequences, which Warner Brothers had previously utilized in the 1969 Sam Peckinpah film The Wild Bunch, and were also subsequently utilized for the action sequences in the science-fiction series The Six Million Dollar Man. The late Brandon Lee, son of Bruce Lee, played Caine's son, Chung Wang. Toward the end of the film, Chung Wang asks Caine if he is his father. The question seems somewhat ironic since—in real life—Brandon's father was a contender for the role of Caine in the series. After Bruce Lee lost the part to Carradine, he went back to Hong Kong, where he made The Big Boss, the film that began his legendary career in martial arts movies. In Kung Fu: The Next Generation (1987), the story moves to the present day and centers on the story of Johnny Caine (Brandon Lee), who is the great-grandson of Kwai Chang Caine. It explains the original Caine had married and become a town's medicine man. One night he died of heart failure. He appears as a ghost to his grandson and great-grandson, who later destroy a narcotics operation. Two decades after the first series ended, a second, related series titled Kung Fu: The Legend Continues running in syndication followed the adventures of Kwai Chang Caine's grandson, also named Kwai Chang Caine. It again starred Carradine, this time as the grandson of the original Caine, and introduced Chris Potter as his son. Caine mentor was played by Kim Chan as Lo Si (The Ancient) / Ping Hai. The second series ran for four years, from 1993 to 1997. The first season was released in Germany on DVD in 2009. In June 2006, Ed Spielman and Howard Friedlander announced that a feature film (which would serve as a prequel to the original Kung Fu series and take place in China) was in development. In September 2007, it was announced that Max Makowski would direct the movie and that he planned to make the film edgier than the original television series. Actor-director Bill Paxton was in talks to direct the adaptation of the TV series. On April 11, 2014, The Hollywood Reporter reported that Baz Luhrmann was in talks to direct the film, and if the deal was made, Luhrmann was to rewrite the film's script. In September 2017, Fox, it was reported that Greg Berlanti and Wendy Mericle were developing a female-led reboot of the series. Warner Home Video released the entire series on DVD in Region 1 between 2004–2005. On November 14, 2017, Warner Home Video re-released all three seasons, as well as the complete series set on DVD in Region 1. 1973: Emmy Award, Best Cinematography - One Hour Drama, Jack Woolf. 1973: Writers Guild of America Award, Best Drama, Herman Miller, episode "King of the Mountain". In the film Office Space, characters Peter Gibbons and Joanna start a relationship when they both admit to being big fans of Kung Fu, and suggest watching it together. In the film Pulp Fiction by Quentin Tarantino, Jules tells Vincent that he intends to "walk the Earth like Caine in Kung Fu." Tarantino later cast Carradine as the title character in his films Kill Bill: Volume 1 and Kill Bill: Volume 2. The British comedy series The Goodies had an episode called "Kung Fu Kapers" which was mostly a parody of Kung Fu. The casting of a Caucasian actor in the lead role of Kwai Chang Caine and other forms of cultural appropriation in the series have been discussed, including David Carradine performing in yellow face. ^ "Martial Arts Myths". Inside Kung Fu. Retrieved August 4, 2010. ^ "Season 1 air dates, Pilot aired February 22, 1972". Retrieved December 3, 2018. ^ "Season 3 air dates". Retrieved December 3, 2018. ^ Weber, Bruce (June 5, 2009). "David Carradine, Actor, Is Dead at 72". The New York Times. The New York Times Company. Retrieved August 17, 2010. ^ Jonathan Herman (2013). Taoism For Dummies. John Wiley & Sons. p. 182. ^ "The Tao of Kung Fu - a philosophy of life that is not about fighting". Kung Fu Fitness and Defense. Retrieved December 1, 2014. ^ "We only know good because of evil". Tao of Kung Fu. Retrieved December 1, 2014. ^ Pilot episode shows a telegram (59 min. in) dated November 1873, placing the character's birth squarely in the mid-19th century, 1840–1850. ^ "Memorable quotes for Kung Fu (1972) (TV)". Retrieved March 5, 2009. ^ "Independent Lens . SHAOLIN ULYSSES: Kungfu Monks in America . Kungfu Goes West - PBS". www.pbs.org. Retrieved May 26, 2018. ^ John Stanley (January 24, 1993). "New Fu: David Carradine revives successful '70s series in 'Kung Fu: The Legend Continues'". San Francisco Chronicle. ^ Jonathan Storm (January 27, 1993). "Still Alive and Kickin' David Carradine Is Back in 'Kung Fu' – 150 Years Older and a Little Wiser". The Philadelphia Inquirer. ^ Fleming, Mike, Jr. (October 31, 2011). "Bill Paxton In Talks To Direct 'Kung Fu'". Deadline Hollywood. Penske Media Corporation. Retrieved October 31, 2011. ^ "Baz Luhrmann in Talks to Direct 'Kung Fu' for Legendary (Exclusive)". The Hollywood Reporter. Guggenheim Digital Media. April 11, 2014. Retrieved April 11, 2014. ^ Andreeva, Nellie. "'Kung Fu' Female-Led Series Reboot From Greg Berlanti & Wendy Mericle Set At Fox As Put Pilot". Deadline Hollywood. Penske Media Corporation. Retrieved September 28, 2017. ^ Pesselnick, Jill (May 11, 1999). "Herman Miller". Variety. Retrieved August 4, 2010. ^ Matsumura, Rachel (September 27, 2017). "David Carradine stars in ABC Network's Kung Fu". Casting Controversies. Retrieved March 21, 2019. Anderson, Robert. The Kung Fu Book: The Exclusive, Unauthorized, Uncensored Story of America's Favorite Martial Arts Show. Pioneer Books, Inc., 1994. ISBN 1-55698-328-X. Carradine, David. Spirit of Shaolin: A Kung Fu Philosophy. Boston: Charles E. Tuttle, 1991. ISBN 0-8048-1751-0. Pilato, Herbie J. The Kung Fu Book of Caine: The Complete Guide to TV's First Mystical Eastern Western. Boston: Charles E. Tuttle, 1993. ISBN 0-8048-1826-6. Wikimedia Commons has media related to Kung Fu (TV series).